Today I visited your store for the first time. I’d always wanted to go but never gotten around to it. I needed a new pair of brown shoes for church. The cute little slogan, “You should go!” from the commercials popped into my head. So I went. 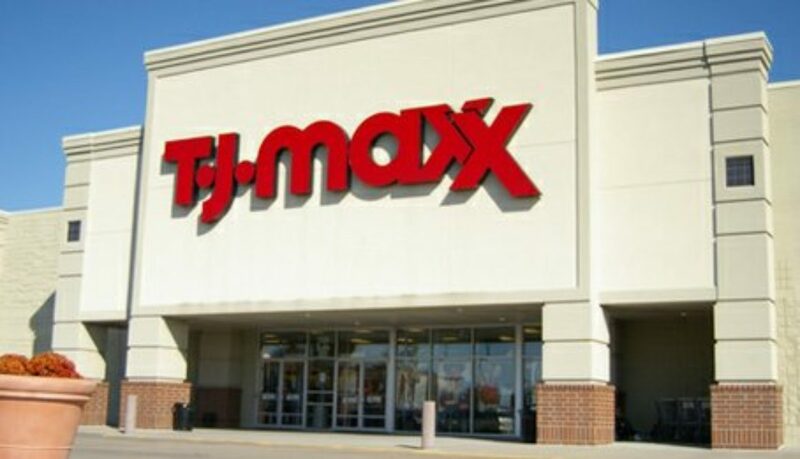 My first thought was that TJ Maxx knows the audience. As a writer, I know that knowing your audience is crucial to success. The store was laid out well. Everything was easy to find and there was enough room in the aisles for me to maneuver my shopping cart with ease. However, I experienced a problem. A big problem that left a bad taste in my mouth. I went to try on a pair of shoes by the dressing room. I sat down on the nice bench and began chatting with the employee on duty at the fitting rooms as I tried on my cute pair of shoes. I loved the shoes. I was sold on them. Little did I know what would happen next. You see, I am on oxygen for most of my day. I’m allowed to be off it for a few hours at a time. I was running a bit short on the time that I had left and I needed to use the bathroom. I asked to use the handicapped accessible bathroom. Your employee on duty said, “Oh, no ma’am. That’s only for handicapped people.” She was very polite and pointed me to the bathrooms on the other side of the store for regular people. I am a four time open-heart surgery survivor. I wanted to pull down my shirt and show her my scars. But I didn’t. Instead, I walked across the store to the other side, fuming. As nice as the restroom was, it did little to defuse my anger. I bought the shoes, but as I drove out of the parking lot, I was still angry. I drove down the strip to Ross, Dress for Less. I found a pair of shoes there right off the bat, $10 cheaper and more comfortable and that didn’t leave a bad taste in my mouth. So I bought those instead and returned the other pair of shoes. The pair from your store was adorable. I loved them. They looked really cute on me. I have a hard time finding shoes because my heels are so narrow. The strap around the ankle helped, even with my narrow feet. My feet are narrow due to my birth defects that also caused my cardiac complications. But I just couldn’t wear them without being reminded of this incident. I’m not writing this letter for my own personal gain. I want nothing from you. No money, no anything. I’m satisfied with the refund I received. The only thing I ask is that your employees be on the look out for individuals with disabilities and invisible illnesses to know better how to serve their needs. We are your customers, too. Please consider adding more thorough sensitivity training about how to deal with this issue. Mother’s Day has always been a struggle for me. The most obvious reason being, I’m not a mother. I wanted to be one very badly most of my life. The only reason I liked the holiday at all and didn’t loathe it was because my mother is a wonderful, godly woman who sacrificed a lot for me growing up to keep me alive and she deserved to be honored. My mother was my hero growing up. I wanted to be exactly like her. I wanted to teach like her. I wanted to have a family with the same number of kids like her. I wanted basically to copy my mom in every possible way I could. Knowing my Mom deserved it made the day a little easier. But jealousy still clawed at me. I grew to hate and resent Sunday on Mother’s Day, to where I was glad if I was sick because I could have an excuse that was perfectly valid to stay home and no one would ask me uncomfortable questions or look at me with pity. I wished it fell on some other holiday because God deserved my worship no matter what day it coincided with. But at the same time, I was mad at God, too. For not giving me the fruit of the womb which was supposed to be a blessing from the Lord. But what I hated the most were sermons about motherhood and how to be a better mother on Sunday mornings. When I did come, I girded my loins, pasted a smile on my face, and had a backup plan if the sermon was about motherhood. I’d let my mind wander wherever it wanted. I’d read other passages, or think about something else entirely. When the sermons weren’t about mothers, and applied to being a godly wife as well, I was eternally grateful. But it’s impossible to know in advance before you get to church what the sermon will be about. (Unless you call the preacher ahead of time, or happen to peak over his shoulder reading his notes, both cases of which are unlikely.). Things are a little different now. It still hurts, but not as deeply. I still weep but the tears aren’t enough fill a rain gauge. Most of you know that I went to my sister’s house for a few weeks to stay with their family. My sister has two toddlers. Clara is four, Philip is two. They were wonderful to play with. They were so excited to have me there and wanted me to come do everything with them. But shortly after I arrived, I became sick. I developed a 100.0 fever, which for most people isn’t significant, but for me, it saps me of any and all energy to function. I played with them as best I could, and slept or sat staring into space the rest of the time, totally devoid of energy. This went on for about a week until finally Leah took me to the doctor. As it turned out, I had an ear infection. I got some medicine and within a couple of doses was well on my way to feeling better. But as I was trying to get better, I had to rest a lot. As I was lying there on my makeshift bed of an air mattress and I thought about what it must be like for Leah everyday. Two people to feed, clothe, make sure they’re happy, healthy and whole. Whether you feel like it or not. And you don’t get to send them home to somebody else. If you’re lucky, your husband might be able to help take care of the kids, but he might not. I thought about that for awhile. Babies are fun to hold and snuggle with. But they need care 24 hours a day. So do toddlers. Leah’s life was busy and hectic with two rambunctious children all the time. Even when sick. What must my mother’s life have been like? Caring for me while I was in the hospital. Working so we could have insurance so that I would be able to have the medical treatment I needed, whether she felt good or not? The longer I thought about it, the more I realized the life I thought I had wanted would never have been sustainable. Even if my children had been perfectly healthy, I wouldn’t have been. And they would eventually get sick and need me to care for them. And my poor immune system means I would catch what they had, nine times out of ten. Tim would be left alone to do it all. That’s not a helper. And my body would have eventually collapsed from the strain. And suddenly I realized, I didn’t want to be like my mother. I didn’t want to be like my sister, either. My mom was still my hero. But I was perfectly happy to be me. I’m perfectly happy to be able to sleep in. I’m perfectly happy to have peace and quiet. I’m perfectly happy to have four cats in the bed to snuggle with and a husband who loves me who can take care of me and the house when I’m sick. My life isn’t the same as theirs. Mom is a teacher. Leah is a mother. And as for me, I’m a writer and proud of it. Everyone’s been asking me about my secrets to all the weight I’ve lost. I still have a good way to go before I reach my target weight. But I thought it was time to tell my story about how this journey all began. So when we last left off, which was admittedly a long time ago, my mom posted about how often I was at the doctor and wondering if things could change for me. Well. After the last several months, I finally have an answer for her. Some things can change and will change for the better. Some things won’t. There is a lot I can do to help myself. I’m not as helpless as I thought I was. How did I realize this? For those who do not know, TMJ is short for Temporomandibular joint dysfunction. What is that? Well short explanation: my jaw joints no longer work the way they’re supposed to. This was confirmed by MRI testing. The meniscus on both sides are displaced. One permanently, the other moves in and out. What does that mean in layman’s terms? I had to drastically change my way of eating. I was banned from crunchy foods. Crunchy foods include cookies, ice, chips, croutons, anything with nuts, my favorite candy bars, you name it, I couldn’t eat it. To say I was upset about it is an understatement. But it was a blessing in disguise. It sparked the beginning of change. It rewired my brain. A marvelous blessing. One of the best things to ever happen to me. If you have intense pain upon eating something, you sure will think twice before putting it in your mouth ever again. I dropped my 30-year-old ice crunching habit cold turkey on the spot. My parents had tried everything short of breaking my jaw to get me to stop this habit as a child. Nothing worked. I chewed all the sealant off my teeth once. They gave up after that. All the things that I had loved as comfort foods were crunchy and horribly bad for me. I was eating way too much sugar and nothing at all resembling a healthy diet. I lost ten pounds alone just on the soft food diet. Then I bought a writing workshop. That wouldn’t be too big of a deal, normally. I buy them fairly often. But this one. This one was different. This one changed my life. What was it? My writing was feeling a bit lackluster at the time and I needed something to get me going again. This was a writing workshop of hers I’d wanted to take for a while and in that course she took what she learned about weight loss and applied it to writing to show how your brain works to trick you into doing what’s bad for you. What REALLY got my attention was her own brutal honesty and that she realized at some point she was suffocating herself and for what? A few potato chips and some candy because they feel good and she didn’t want to give them up? That was a huge whack on my head. I can’t describe the feeling that came over me then. I read the words in black and white on the video transcript. They were there on paper right in front of me. The video itself was in my ear at the same time. The same excuses she’d been using, I’d been using. I was doing the exact same thing. That workshop plus some cold, hard science about my genetic condition made me really understand that I had to change. 22q11.2 Deletion Syndrome varies a lot among patients. I began to research my condition more. In my research, I read that our lifespan depends a lot on quality of care. With good quality of care, we can have a normal lifespan. I have the best surgeons in the world at UAB. They are excellent. But excellent quality of care did not mean being 70 pounds overweight. I began to be really uncomfortable. But what really was the real kicker was that with poor quality of care, the median age of life expectancy was 41 years. When you’re a kid, 41 years old seems ancient, but standing on this side of 32, I gulped. That was only 9 years! That wasn’t nearly long enough to write all of the stories in my head and to have the career I wanted! 70 pounds of extra weight was definitely poor quality of care. Even the best of surgeons couldn’t fix that for me! We’d looked into it before. Because of my extensive medical history already, the fewer surgeries I have the better. 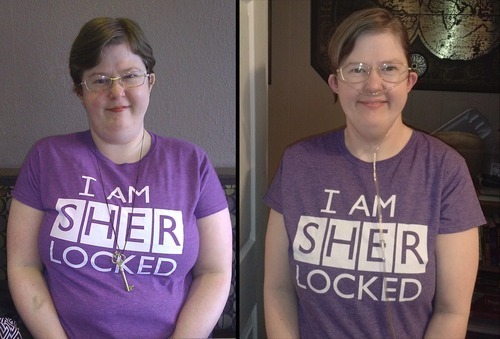 Gastric surgery is irreversible and my doctors did not want me doing it. The only one they would approve for me at the time was the lap band, because it could be taken out in the future if necessary. But the lap band severely limited the medications I could take. Surgeons weren’t the answer to fixing this problem. I knew I had to change. And change drastically. I’d lost the first ten pounds without trying. The rest, I lost the hard way. I began eating lots of protein. Chicken being my preference because it is soft and easy to chew. I used the canned stuff at first, which helped with portion control. Then I started looking at the sodium counts of everything in my food. Yikes!! They were terrible! I began to read labels. We started swapping our pantry items for low sodium stuff. It had been doctor ordered by my cardiologist years ago but I’d ignored it at as unimportant at the time. I gave up Dr. Pepper. It took several weeks of gradually weaning off it, going little by little, until I was finally pouring the can just out of habit and throwing the rest away. When I realized I was doing this, I decided it was time to drop it completely. And I did. I gave up most sugar. My one small treat has been mints. Because they’re soft and mint has the added benefit of calming me down. I can eat a couple of them and have just enough to have a little something sweet. I gave up junk food, microwaved dinners, most bread, and pasta. Let me tell you. THIS WAS HARD. The withdrawals were horrible. It was an emotional roller coaster. My panic attacks became even worse. I fortunately had a dear friend help guide me through this intense process and hold my hand to hold me accountable. She pushed me to better myself. My family members had tried their very best to get me to do the same thing. My parents had offered me a trip at one point to anywhere I wanted to go in the world, if I lost the weight. I never took them up on it. I had to hit rock bottom before I could begin to climb up. Starting exercising was very difficult. When I first began exercising, I had so little arm strength I could barely lift a pound. I used green bean cans in the kitchen and began practicing lifting those. I walked for a few minutes standing in place also in my kitchen. I put up a load of laundry piece by piece. I couldn’t carry the basket, it was too heavy. But I did it. And gradually, over time, I got stronger. I graduated from 1 pound hand weights to 3 pounds. Now I can carry a small load of laundry. I can do a very small load of dishes. Within the last year, I’ve lost 36 pounds. I’ve gone from 187 to 151. I was wearing size 18. Now I’m at size 12. For years I convinced myself that I didn’t need to eat healthy. My body was so messed up with its missing parts, my diet wasn’t going to fix anything. But it has. Losing weight hasn’t solved all my problems. I still get sick a lot. For weeks at a time. I still visit the doctor fairly regularly. But it has helped a lot. I have more positions to sleep in at night, now. I can move around more and I don’t have to spend all of my days sitting in bed like an invalid. With the increase in energy, I’ve had more energy to write. I’m working on my books. I have at least three projects in various stages of progress on my desk. I’ve been posting on Twitter and making friends with other writers, teachers, people who love science fiction and fantasy as much as I do, agents and editors, too. Sometimes bad things happen, but they can turn out to have good results. They can be wonderful blessings in disguise. “All things work together for good for them that love the Lord.” Romans 8:28. @miaokuancha said:I’m so overjoyed to see you blogging again! Look at you shining in your picture, too. You go girl! Thanks!! It’s not been easy. Neither has been trying to figure out how to reply to comments on tumblr, lol. I’m still fairly new to using this. I’m more familiar with Livejournal. It’s so good to see you and know you’re still reading! I’m on Twitter, too, btw. 😀 I post there much more regularly. I’m lmorbison on Twitter. For several weeks, I had been contemplating having gall bladder surgery. I flip-flopped back and forth, trying to decide if I could just live with the pain and discomfort or if it would be best to just go ahead and take care of it. I heard from friends on both sides of the fence. Some said they lived with theirs for six years before having it out. Others said they didn’t wait and it was the best decision of their life. So, what to do…I called and set up the surgery. Then, I called and cancelled the surgery. Then, I called again and set it up. The nurse probably thought I was crazy, which, under the circumstances, is a perfectly logical assessment. Anyway, I finally set the date, got all the pre-op information and then waited. On the night before the surgery, I was beginning to wish I had cancelled. I really hate being put to sleep. Not because I don’t think I will wake up, but I just hate that feeling of wanting to be awake and feeling unable to be totally awake. I know some people like that sleepy feeling and they just sleep for as long as they can. I don’t. I want to be awake immediately and my first words are always, “Diet Coke.” As I stood in the bathroom, thinking about how much I hate being drugged, I also thought about how much I hate having an IV. All my life, I have hated shots, needles, and IVs. I literally break out in a cold sweat, feel faint, and I panic. Then, it hit me. What must it be like for Lauren? How can she have faced all those surgeries without going crazy? My surgery was going to be simple. Three small incisions, laproscopic, able to be up and around in a few days, how bad was that? What if I was having heart surgery instead? I felt sick just thinking about it. Not just sick thinking, “What if that were me?” but sick thinking about my precious daughter who had endured it, not once, but multiple times. I hated the image in my head. I hated the pain that I knew she had. I hated myself for being so weak. I hated the fact that it wasn’t over for her. And that was the biggest ache of all. I know that Lauren and I started this blog a long time ago. We both wanted to tell her story and mine. The daily rigor of working as a teacher kept me from continuing, though Lauren asked me regularly if I could start back up again. Now here I am, with another piece. This piece is not so much a telling of the story of her life, but a look at her incredible obstacles. Since my last post, she has suffered sicknesses of all types. She’s been to the doctor every month, sometimes multiple times. Will she ever get better? That’s the question she wants answered. I don’t know what I should tell her, because I’m a little afraid of what the answer might be. Thankfully, God has provided abundant blessings on her behalf, so I have hope. Hang in there, Lauren. I love you. Being stranded stinks. Besides for the obvious fact that you’re stuck, it’s stressful because you have a problem and it’s sometimes difficult to solve it. Yesterday it happened to us. Tim has been sick with a deep cough over the last few weeks so I thought since he’d used up most of his leave time I’d get him to the doctor over the weekend and that would be easier than taking more time off. I decided to go with him to keep him company since he doesn’t really like going by himself and leaving me at home when he goes places. That was why we got married, to stay together. Little did we know I would end up letting the battery drain to the point of the car dying. Little did we know we’d end up having to call for a taxi to go home, get the other vehicle, and come back to jump this one off. Little did we know how that day was going to proceed. I would never have gotten out of bed that day, had we known. I doubt Tim would have either. As I was saying, moving on. We were stuck and sick and miserable. But we finally made it home. Boy we were happy to be home. We would never leave again. There was actually one time in my life I was very happy to be stuck on the side of the road. Only once. It was a bright, clear spring day in March in the year 2004. The sky was the forget-me-not-blue and birds were singing. We weren’t listening, though. We were too busy packing to get everything ready and leaving for the trip to Birmingham, UAB where I was scheduled to have valve replacement surgery the next day. We had an appointment for me to be admitted and if I missed the appointment the whole surgery would have to be rescheduled and who knew how long that would take! I would have been quite happy to postpone that surgery forever. I was not looking forward to it and had been dreading it for weeks. No matter how many surgeries you have, nothing really prepares you for going through another one. There are all manner of things that can go wrong. And it’s a lot of physical and psychological trauma. So I really, really did not want to make it to the hospital. Because at the end of that tunnel was a pretty dark stretch of road. We were driving along the interstate and making great time, in the silver grand Am which we’d only recently purchased when all of a sudden, the vehicle came to a halt. This was before we had smart phones all the time everywhere or Facebook, and so Tim was panicked about what to do. We had a trac phone in case of emergencies but we didn’t have anybody at church’s number. We didn’t have a phone book in the car either. Finally we dug through the back seat and found some old church bulletins. They had the name and phone number of the preacher and some of the elders and deacons on it. We were able to call one of them and then get a tow truck to come and get us and the church member picked us up at the towing place so that we could go home and get our other vehicle. I was pleased as punch about the whole set up and I thought it couldn’t have been better. I was happy as could be. I might not make it to the hospital! Yay! I might get to have my surgery postponed! Yay! Of course, in reality, the situation was a bit dire, but only Tim seemed to really care at the time. Tim, of course, was really upset about the whole thing. I was quite disappointed when we were rescued. As things transpired, it was a broken gas gauge in that vehicle and we had simply run out of gas. Tim’s diagnosis yesterday was also just as simple: allergies. She can sit and listen to the same story over and over again for quite a long time. She can listen far longer than Aunt Lauren has breath for these days, and longer than the average adult has the patience level for. When I was a little girl, I was much the same way. During and after my open-heart surgery when I was 8, Little Mermaid was my favorite movie. I used to put it in everyday at the same time after lunch. My sister would always come in from school to find it on the television at the same exact part. Most people have phases like that when they’re kids. Unfortunately, I never really grew out of that phase. The ADHD makes it to where I like to read the same books over and over, watch the same movies, eat the same foods, etc and branching out to new things is really hard for me. I’ve read Catherine, Called Birdy by Karen Cushman probably some 600 or more times, my Harry Potter books are in various stages of decay and falling apart due to the number of times I’ve read all of those, and my Little House on the Prairie series is also falling apart. I buy books, read certain ones until they are torn up and then have to buy new ones of the same thing. I’m definitely a fan of e-readers, if for no other reason that my copies won’t fall apart anymore, no matter how many times I read them. But I digress. When I’m looking for inspiration for a novel, I have a select few movies I like to watch. There’s just not that many good fantasy ones out there, and I have my favorites. The same applies also when I’m ill. I want something comforting, not something new, when I’m sick. Unfortunately, I spend a lot of time sick. Tim has tried really hard to get me into new things. He discovered that the best way is to entice me slowly. I got into Stargate SG-1 after watching a couple episodes. I got into Top Gear after watching a very silly challenge episode where they were in Bolivia. Futurama, I’m not quite sure how I got in that one. I’m sure it was probably Tim’s suggestion. He jokes that I only like movies on, “My approved list.” He’s not far from being wrong. That is the way I am, unfortunately. Inevitably something I resist for a long time will suddenly become my new favorite thing once I’ve tried it and realize it’s really good. You’d think I’d’ve learned by now just to take advice and recommendations when given but I don’t. But that’s life with ADHD. Also part of ADHD means I pick out really weird things to remember. For example, I remember that Hermione Granger’s dress for the Yule Ball in Goblet of Fire was a floaty periwinkle blue material; I remember that Catherine in Catherine Called Birdy’s favorite bird was a goose because nobody else likes geese. Her father she compared to a buzzard, her mother to a swan, and her nurse to a nuthatch. I remember Bill Murray’s character “Spencer” in The Man Who Knew Too Little was allergic to Old Spice and he worked for Blockbuster Video in Des Moines, Iowa, and I remember Luke Skywalker’s line in The Empire Strikes Back when Artoo got chucked out of mud by the swamp creature was, “You’re lucky you don’t taste very good,” as opposed to the line that’s currently in there now, “You were lucky to get out of there,” and that Prince Septimus in Stardust loves the color blue. I could go on and on but I’ll spare you. Some of this I’ve picked up from my multiple readings or viewings. Some of it I got the first time through reading or a viewing. I can sit through a movie once and if I liked a particular line of dialogue remember it enough to quote it. Movies I’ve seen a bunch of times, I can quote verbatim. Same with books I’ve read. I’ve got whole sections of Harry Potter memorized by now. Yet I can’t remember a math formula to save my life. Go figure. This is my blurb for the back of the book jacket. My prologue is underneath. 12-year-old Kyran Kyzer doesn’t expect to get a kingdom for his birthday, let alone a magical one. It’s a dream come true! There’s just one problem. He’s the only one in the entire realm who doesn’t have any magic. He thinks he’ll be able to cope just fine. But the problems begin before he even gets there. He needs special glasses to help him read, write, and communicate, most modern equipment doesn’t work for him, and his security people can’t keep track of him. Soon it will be time for Kyran to return to Noveva to take his place on his father’s throne. William Kyzer, 35, bent down to the trunk in his closet, studying the combination lock. It was an old trunk of dark cherry wood with thick brass handles. The lock was somewhat primitive. But then his whole life here in this world had been primitive. It would be a relief to get back home. Assuming that was, that home was still there. And that was a big if. The lock clicked open smoothly. He opened the trunk and climbed down the dozen steps inside to a small room. The room was magically lit so he didn’t need to turn on any lamps or conjure candles and it looked like any ordinary room in the house except that it was inside a trunk. There were shelves of books on the far right hand wall. But he was more interested in what was on the left side of the room. He settled himself at a round oak table with an old office chair. He opened the center drawer in the table and took out what looked like an ice cube. It wasn’t an ice cube, of course. If it had been it would have melted years ago when it was first put in the drawer. It was a hologram module. He then fished a ring out of his pocket and slipped it on his right ring finger. He waved his hand over the hologram module, and it turned on. It made a satisfying snap-hiss noise as it powered up. There was a burst of static as if it were poorly tuned. The image on the frequency stayed blank. Perhaps they were all dead. That was a horrible prospect but it was one that he had to admit was a possibility. Or perhaps the equipment had sat in storage for too long and was no longer functioning properly. He turned the holocube upside down and checked the meter readings on the bottom. Everything looked like it was supposed to. It appeared to be functioning properly. If nobody answered, well… then there was nobody left to reply. At last he got a response! “Yes, Sir. The feeling is mutual, Sir. How is the Phoenix?” he asked. “No, nothing remains not even the mate,” Rothav said. “That’s a pity,” William said and he meant it with all his heart. He suddenly felt old and tired. Before he could ask anything else the General spoke again. “How is the Hatchling?” he asked. “That is excellent news, considering his delicate condition when he flew the nest,” General Rothav said. “Very much so. He has thrived here as we hoped,” William said. “Do you have a time in mind for the Hatchling’s return flight?” Rothav asked. “Not yet. I merely was gaining information with this initial contact. I wasn’t sure there would be anyone left at home to speak to. Now that I know, we will have to discuss things,” William said. “Does the Hatchling know what he is?” Rothav said. There was a long silence and William couldn’t tell if that meant General Rothav agreed or disagreed. He continued as though he agreed. “I’ll be in touch again after we have discussed things. Keep a channel open for me,” William said. “Pleasure for me as well. I look forward to delivering the news to those on base that the Hatchling is alive and will be returning,” Rothav said. “Knight Kysler out,” William said. He stood up and stretched. Things were stable at home. The news about the Phoenix and its mate was horrible, but at least there was a home left even despite that. And that was something to be grateful about. His wife met him at the top of the stairs. “How are things?” she asked. “Stabilized. Things are safe enough now for us to go back,” he said. “Then why do you look so upset?” She paused and then understanding dawned on her. She sat down on their bed while he locked the trunk back up. There was a long silence between them. Tim and I joke that I ought to have two of everything, but for me it’s really true. I need two of everything. No, really. Because if I only have one of something and it’s critical, I will lose it. You name it, and I’ve lost it. I’ve misplaced everything from car keys, dorm room keys, percussion mallets, yarn needles, crochet hooks, and even things like prescription drugs and thick heavy books. I lose things you shouldn’t be able to misplace. But that’s life with attention deficit hyperactivity disorder. This week, I was crocheting and I picked up squares to sew them together. Unfortunately, I couldn’t find my yarn needle. The one I was currently using was a backup for another I’d also misplaced. But now I’d lost the back up too. And I couldn’t go any further on the blanket without another one. Yeah, that was my bad. I ended up having to call Tim at work and asking him, if he would be so kind, could he please pick me up some more on the way home. Luckily, he is agreeable. I couldn’t remember the brand name of the kind I’d lost, so he picked out some. They weren’t the right kind but they worked in a pinch. And later that night, after he’d bought replacements, of course, I found the missing needle I’d lost in the first place, so he returned the unopened packages and got me the right kind. Once I lost a set of van keys when our church youth group was out at a rally. I was going to the car to get something I’d left there. I dropped the keys in the grass along the way. The entire youth group had to help me hunt for them. This was a regular recurring event in my youth. When I was in the marching band I played the bells. It was the only instrument I could play because it didn’t require any oxygen on my part, and I could stand in the pit and not have to walk around the whole time. We regularly performed in special competitions and one Saturday before a show, I dropped my mallets in the parking lot. Now, if I’d had my regular set that wouldn’t have been as problematic because they were white and you could see them a mile away. But I didn’t have them. I was using a back up set. And these had black handles with a clear mallet head. And I’d lost them not long before we were scheduled to perform. Yeah. We eventually did find them, and we did well that day. But it was definitely not one of my better moments. It’s not just the losing things that I have problems with though. I also don’t do social relationships very well. I frequently stand too close to people when talking and interrupt to put in my viewpoint, or I block someone by mistake because I don’t realize they’re walking behind me. Self-awareness is lacking. I’m on medication and this helps to manage my ADHD but it’s not perfect. And sometimes I forget to take my medication. It’s a double whammy. So the next time you ask me if I’ve lost my mind, please be aware I probably have! Sorry for the delay in blogging. My collaborator has been really busy with end of summer and beginning of school year things. My own blogging Muse ran away and left no forwarding address until now. She was rebelling because I’d used up all the ideas she’d given me while Mom was on vacation and busy with school. I felt guilty constantly reminding her that we had a blog to maintain and adding one more item to her already busy workload. But today the Muse gave me a really good idea, so here I go. As most of you know, Tim and I have four cats, one of which we adopted earlier this year as a result of a visiting neighbor’s feline. The neighbor’s cat was so sweet on Tim and warmed Tim up to the point he wanted to go get another when I suggested the idea. We browsed the Pet Finder for a little while and there was a really cute cat listed on the thing named Wilma whose first owner had died. It said she loved to play and head butted even the cameraman taking pictures for attention. We think head butting cats are adorable, so we went to the Pet Placement Center where we got Caramel and Hazelnut. As things turned out, Wilma (whose name is now Pepper) also has a disease called stomatitis. It’s an auto-immune disorder responsible for a lot of things, but is manageable with shots. They told us at the time about how much things would cost and we thought she deserved a home, so we took her in. Cats normally don’t like going to the vet and Pepper is no exception to that. Since Tim only has one good hand, the task falls to me to get the cats into the carrier whenever they need to go anywhere. Caramel waltzes right in. He’s perfectly healthy and has had no fear of getting in the carrier. Vanilla too, waltzes into the carrier like there’s no problem. Hazelnut and Pepper are entirely different. Hazelnut fights like a demon cat and Pepper also struggles to get away. She broke free once, but her hiding place that she’d chosen to hide from me was a small bookcase she likes to use to jump on top of the china cabinet. She would have done better if she’d jumped actually onto the china cabinet, as there’s no way either Tim nor I could get her off the top of that thing to go to her appointment. Thankfully I was able to recapture her and put her in the carrier the second time without a lot of fuss. Once the door shut, I could hear her cries. She’s not a very vocal cat unless she’s going to the vet. As I sat there listening to her cries, it suddenly struck me that this must have been how my mother felt. I was telling her it would be okay but she’s only a little kitty and it was very scary to her. Since I am sick this week with a cold, I couldn’t go with her and hold her paw, but I knew that Tim would reassure her. I hated shots of any kind when I was little. Blood work for medical procedures was painful. Unfortunately for me, I had to have a lot of them. And I didn’t want to go. I would cry and cry during the tests. Mom had to be the one to hold my hand and tell me things would be okay if I could just hang on a little bit more. Of course, I didn’t understand when I was a kid. I just wanted things to stop. Even as recently as my last heart operation I pitched a fit when they were putting the I.V.’s in. I didn’t want that needle. Now that I’m all grown up with “kids” of my own, know how hard taking me to get medical things all the time must have been for my mom. I’m just thankful I had such a good mom who took care of me when I needed it and helped me through the scary parts and gave me a hand to hold. I assured her that I was fine and that this time was much easier than last time. And for the most part that is true. I haven’t had nearly the difficulties with Leah being pregnant the second time as I did the first. But there’s always a small bit of lingering sadness that remains behind underneath the happiness. I won’t be able to share the things with Leah that she’s sharing with me. My hysterectomy makes that impossible. I know I made the right decision and I don’t regret it in the least. My pregnancy would have been an extremely high risk one and that’s even without the factoring in of me carrying 22q11.2 Deletion Syndrome. I would have had a whopping fifty percent chance of bringing a baby into the world that was equally as bad off or worse off than I was myself. So, yes, I’m confident that I made the right decision in my head. Even in my heart, I’m much more confident this time around than with the last one. It wasn’t always this way though. She was smarter than I was, made better grades in school than I did, liked better fashion, had more friends, and on and on the list could go. When she was pregnant for the first time it was extremely difficult for me. I had always wanted to be just like my mother. Being just like my mother included having three kids of my own and a family. My doctors had always assured me that I would probably be able to carry a pregnancy to term without any problems. That was before the lung injury. After that happened, we knew there would be no way for me to have a baby. Babies take a lot of space up and are right next to your rib cage. I was already on oxygen even without a baby. Who knew what having an extra little person inside me would do to me. The choice for the hysterectomy had been the best one. Mom had always said that she didn’t want to have to choose between keeping me alive or keeping the baby alive. Given the complications of my health and heart already, there was a good possibility that eventually we might have faced that if I’d gone that route. We’d made the right choice for everybody. But it wasn’t the easy choice. Nothing else was said in the scene. But there didn’t need to be any more words. I knew just how she felt. When Leah first told me she was pregnant with Clara, I closed the door in my room and cried. The next few months I struggled hard with bitterness and envy. While I worked on the baby blanket for Clara, sometimes I would dissolve in tears at random while stitching my squares. Tim was very supportive during this time, making me feel better when I needed him to. I had him and I had the kitties, but it still wasn’t quite enough. I remember praying for something I could do; preferably something I could do better than Leah. But something. Anything. I wasn’t going to be picky about what. But I wanted a way to stand out. I wanted something to fill the void about the lack of little feet running through the house. The following year in February, I found Holly Lisle’s Create-A-Plot Clinic and not much longer after that, I ended up signing up for her How to Think Sideways writing course. The next few months I learned everything I could about writing fiction. I soaked it up like a sponge and then wrung it out on paper. I came up with some book ideas based on my feelings about the pregnancy that likely would have put me in an institution had I showed them to anybody but fellow writers. I also started dabbling in poetry. I wrote some nature poetry and some dark and depressing poetry. But the months went by quickly instead of plodding as they had been before. 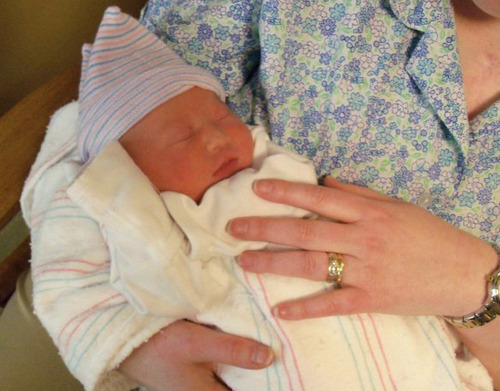 April 22, 2010 Clara was born. She was a month earlier than she was supposed to be. Dad called to tell me the news. I called and talked to Leah for a few minutes. After we hung up, I cried. I gave treats to the kitties to make myself feel better and went to Hobby Lobby to get yarn. Retail therapy, I told myself. It turned out I didn’t really need it. Not much later, Dad called again and asked if I wanted to go see Leah and her baby. He collected me in the airplane and we flew to Jackson. Mom drove the car so that we would have a vehicle. Once we united, we stopped at the Papa John’s to get Leah some pizza and bring her some doughnuts. She hadn’t been able to have any sugary sweets during the pregnancy with gestational diabetes. Now that she wasn’t pregnant anymore she could have all she wanted. I wasn’t sure what I would feel when I gave her my presents. I had ordered some clothes specially made and I brought those with me. I can’t remember if I gave her the blanket before this or at the same time. But I do remember the first time I held Clara. She was so tiny and so precious and so perfect. All of the bitterness and envy I’d been feeling since Leah first became pregnant just melted away like butter. Leah trusted me with something special. How could I be sad around what was so full of life? Fast forward two years later. Clara is now walking and talking. We love to Skype together, although she doesn’t quite understand the fact that I’m far away and not in the actual room. But I love my sweet girl. She can always brighten my day just by being with her for a few minutes. So when Leah told us at Christmas she was pregnant again, I was excited instead of sad. I didn’t spend the months between dwelling in misery and being mad at her like I had the first one. Instead, things continued as normal. I worked on my manuscripts and I crocheted on shawls and blankets. Today when I got the news she’d finally had Philip, instead of sitting at home crying and then taking myself shopping, I was working on a shawl for a friend of mine. I quickly posted the news on Facebook. And the only retail therapy I needed this time was finally buying her a gift. So when my Dear Friend texted me to ask, I was able to reply with confidence. I might not get everything my sister does and I can’t be just like my mother since I’m not in the best of health, but you know, I’m okay with that. We’re different people. And Clara brought us both closer together. This time I was able to really be happy for my sister like a sister should be. And I am happy for myself, too.